This post shows a solution to convert AVI to MOV when you have trouble importing AVI videos into QuickTime Player. This is also one of the most efficient way to transcode AVI videos with industry-leading speed. It is common for Mac users to get some movies/videos in AVI format, either from the internet, digital cameras or shared from friends who use Windows. Most of people wanna convert AVI to QuickTime MOV Mac for playback or editing with ease since their AVI videos can't be recognized by QuickTime. As is known to all, AVI (Audio Video Interleaved) is a multimedia container format introduced by Microsoft and can contain both audio and video data. The common video codecs of AVI include DivX, Xvid, MJPEG, MPEG-4, MPEG-3, MPEG-1, MPEG-H, etc. There are many Windows-based media players supporting replaying AVI format video, but you can't play AVI on Mac, QuickTime, iTunes or other iOS devices. Specifically, you will encounter no sound and get an error message stating "QuickTime Player can't open avi." QuickTime, a popular media player developed by Apple Inc, can stream video formatted with MOV, MP4, M4V, etc. BTW, QuickTime only can play partial AVI file with Motion JPEG video. In other words, to play all sorts of AVI videos on QuickTime, you need to convert AVI to MOV to be compatible with QuickTime. There are many kinds of AVI to MOV converter software in the market. The output video quality and the speed must be the key factors that you should be looking out for. 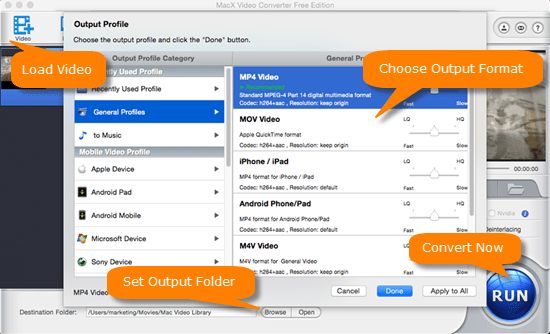 MacX Video Converter Pro enables you to decode AVI to MOV on Mac (macOS Mojave) and play AVI files on iPhone, QuickTime, iPad (Pro), the new Apple TV. Equipped with high quality engine, Multi-core CPU and hardware encoding technology, this Mac software can convert AVI to MOV format without suffering any quality loss, up to 5X faster than other rivals in the market. Besides, it also can help you download videos free from YouTube, Facebook, Vevo, Vimeo and more 1000+ online sites in AVI, MKV, MOV, 3GP, 720P/1080P HD, 4K UHD, 3D and more for offline playback on QuickTime, Mac, Apple TV or iPhone iPad iPod devices. After free download this professional AVI video processing app, launch it and click "Add File" to load the AVI files. Select QuickTime supported format MOV from the format list as the output format. What's more, the default optimized video settings make the output QuickTime MOV video looks great on your player. Note: Enable the Intel QSV hardware acceleration technology to speed up the AVI to QuickTime MOV conversion up to 5X faster than others. Click the "RUN" button to start converting AVI to MOV format on macOS. More than expected, this AVI to MOV converter for Mac also supports to transcode AVI to MP4, AVI to DVD, MPEG, FLV, MKV, SWF, etc. Why do you still hesitate? FREE download and begin the enjoyment now! Although the aforementioned Mac software is full-featured, many users still are looking for a free way to decode AVI to MOV for replaying on QuickTime. Frankly, you can rely on all sorts of free online video sites. Here, we take aconvert.com as a example ro show the detailed steps to transcode AVI to MOV. Step 1: Open aconvert URL on Firefox, Safri or other browsers and click "File" button to select a file on your computer. Alternatively, click "URL" button to enter an online file URL. But, remember that AVI video file can't exceed 200M. Step 2: Choose MP4 as the target video format. This online free site also enables you to convert WMV to MOV Mac, FLV to MOV, AVI to MP4, MKV to MP4, AVI to WMV, etc. Step 3: Tap "Convert Now!" button to start AVI to QuickTime MOV conversion task. Later, the output video file will be listed in the "Conversion Results" section. Best AVI to MOV video decoder - easily and fast change avi codec to mov for QuickTime with high quality reserved. World's No.1 fast speed.